ZONE3 software is the culmination of OGP’s experience at the forefront of the multi-sensor metrology world for the past 30 years and more. This next-generation software package represents a totally new way of working with multi-sensor technology, where built-in 3D CAD-based animations clearly display relationships between parts, sensors, datum alignments and machine tooling. When machine operatives can seamlessly interact with measurement systems, the power over the production line is placed directly in their hands. ZONE3 is a critical part of the Industry 4.0 jigsaw, delivering major quality control benefits for businesses of all sizes and across all sectors, from medical and automotive to aerospace and consumer goods. ZONE3 accepts CAD models in native format, using the CAD model and other innovative characteristics to speed up automatic routine building. It’s possible to load multiple CAD models if the task requires it, such as a fixture model and part model. The software’s ‘Apply to Similar’ feature, which copies the steps for similar features in the CAD model to all instances, makes programming fast and easy, working alongside other tools to maximise manufacturing throughput. Synchronous, full-field image processing and high-speed cameras allow entire scenes to be measured instantly. ZONE3 is truly sensor independent, operating systems with video, laser, touch and scanning probes. It is designed to work with any combination of these sensors in any order, letting you choose the best measurement tool for every feature of a part, even when those features are not easily accessible. Operating alongside other OGP metrology applications, including MeasureMind and Measure-X, ZONE3 lets you retain your library of existing part routines while adding new 3D measurement capability to a SmartScope multi-sensor metrology system. With OGP technology a combination of self-calibrating optics, automatic probe changes and rotary indexers ensure that no feature on a part is missed, meaning one machine can complete every job required of it with unparalleled speed and sub-micron accuracy. It is ASME Y14.5 compliant and boasts GD&T (Geometric Dimensioning and Tolerancing) functionality. 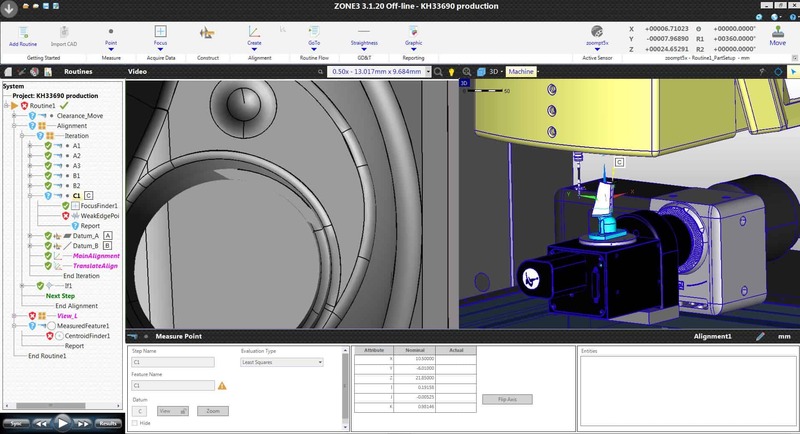 As ZONE3 software works directly from 3D CAD files, common formats such as STEP, IGES, VDA and DXF are easily importable, with no need for file preparation or transformation. The software’s Contextual Feature Creation bases measurements on selected sensor types. If a touch probe is selected, ZONE3 automatically deduces the user’s intention to measure a surface. With video, it assumes an edge measurement is needed. Kinematic model simulation of the machine, parts, fixtures and sensors are updated in real-time, while simple controls let you program the light source, intensity, direction and angle for each measurement finder. Programmable presets let you easily select frequently used lighting combinations. ZONE3’s simple user interface is centered on the part’s 3D CAD model, with the same procedures used for all sensors. Learn one and you’ve learned them all. All key features are logically arranged and visible at all times, with no clumsy pop-up windows to block the user’s view. The straightforward layout offers three logical areas to create or edit measurement routines, meaning you can work in the window that suits your style of programming. Real-time animations are supported by previews that show the anticipated results of user commands, making it easy to confirm actions. With a visual validation of each operation before it’s executed, you get immediate feedback so common errors and unintended consequences are avoided.